“Six Songs” cassettes ready for distribution. Courtesy of Schaefer Studio. “It’s almost uncanny how some wishes get answered. Just last issue I suggested that the Fashion Jungle should get some of their songs captured in the studio, and next thing you know I’m handed a six-song tape. . . . [The FJ makes] not just rock and roll; it’s rock and roll with a little more. 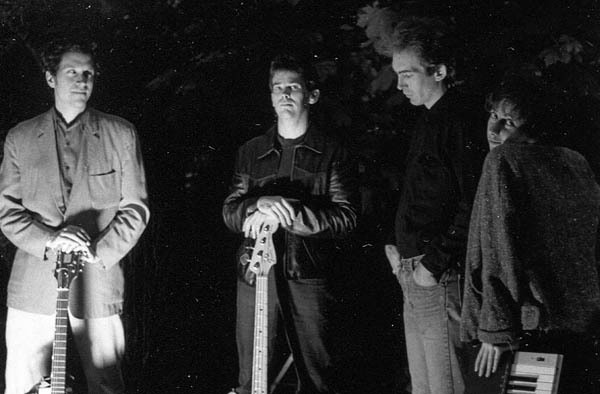 These are the best ‘new wave’ [sic] songsters in the state. 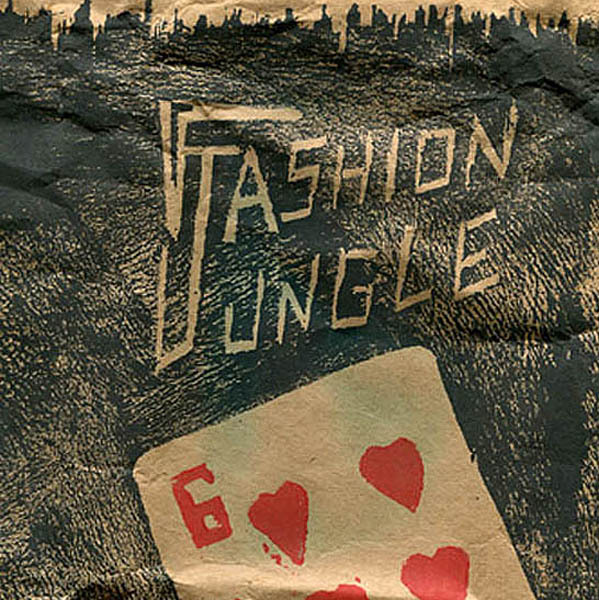 After 28 years, hear the Fashion Jungle’s sole commercial recording with brand-new clarity and impact. Where other bands go on the road for weeks and months, jammed into a van, breathing each other’s sweat and booze fumes, couch surfing and accumulating laundry like it was road miles, the Fashion Jungle spent just a couple of nights together away from home. 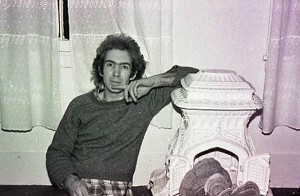 Steve Chapman at the Outlook during the “Six Songs” sessions, January 1984. Steve’s songwriting hit a new excellence on this project. Digital scan from black & white negative/Hubley Archives. 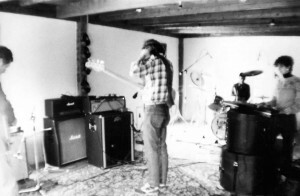 But, like the endless touring upon which most bands build a career, the result was a focus for our musical aspirations: a six-song cassette that would, we hoped, at best help us break out of the Portland scene and, at worst, earn us a few bucks. Gee, whatever happened to those few bucks? In the early winter of 1984, we holed up at a studio in Bethel, Maine, for our third stab at recording. The Outlook was run by Ted and Connie St. Pierre, a friendly couple who not only recorded musicians but put them up in a big old white-painted farmstead a few miles outside of town. The former living room was the studio, and the control room was in an adjacent parlor or dining room. As you would expect, it was spacious, drafty and just what the doctor ordered for atmosphere. I wish I remembered more about the actual sessions, because, I really must say, the recordings indicate that we played great. But it could have been Sergeant Pepper or the 1927 RCA sessions in Bristol, Tenn., and nevertheless what my memory would wrap in tissue and store in the vault of precious moments would still mostly involve . . . food. Steve, Ken and Doug listen to a playback. Gretchen Schaefer photo. For instance. Gretchen and I arrived at the Outlook first, late on a Friday morning, my sainted VW Squareback loaded to the roof with gear. We loaded in and then, priorities being what they are, drove back to town for lunch, enjoying a fine meal in what I recall was a greenhouse-like area in a welcoming restaurant. We were happy with our meal and also about being together at the start of this musical adventure, which seemed the furthest yet I was venturing toward the “real world” of professional music. The glow was dimmed a little upon our return, as we found the other members of the band — bassist Steve Chapman, drummer Ken Reynolds and keyboardist Kathren Torraca — waiting for us impatiently. But no regrets — because that was our last good meal for two days. Kathren, at left, and Ken relax over cards during the January 1984 recording weekend at the Outlook. Digital scan from black & white negative/Hubley Archives. In the arrangement with the studio, meals were included. And what meals! The St. Pierres didn’t eat meat, but neither were they vegetarians, because they apparently didn’t eat fruits or vegetables, either. “Mostly starchy white food was presented,” Ken recalls. “I remember you and Gretchen going out to search for fruit,” specifically a bag of apples, “to augment the constant carbohydrate barrage provided by our hosts.” By the evening of Saturday, our one full day at the Outlook, we were desperate to eat something that wasn’t white paste. As I recall, we laid down tracks during the day Friday and Saturday, and did overdubs into the evening Saturday — I still have a mental picture of Steve on a sofa putting the acoustic guitar onto “Final Words.” My other stray memories include recording the vocals for “Peacetime Hero,” and feeling very excited about the creepiness of them; asking Kathren to put the broken piano into “Nothing to Say”; and trying to get a decent guitar solo for that same song. Once I did, it ended up being the solo forever after. See galleries from the Outlook sessions. Text continues below. I’m guessing we stayed up late both nights to decompress and experience this unusual communal time. Aided by the images presented with this post (which I shot but never printed), I do remember a bit about the evenings. Kathren had a Walkman (the first I had heard of such a thing), and spent a lot of time absorbed in that. 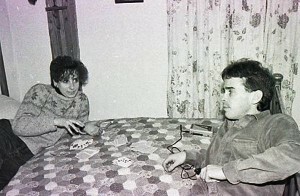 She and Ken played some cards on one of the big old beds in the farmhouse. Gretchen and I had brought my Trav-L-Bar and we put that to good use. Ted St. Pierre, owner-engineer of the Outlook, at the desk. Digital scan from black & white negative/Hubley Archives. And yet we never asked Ted to remix it or have us back to fix it; whether because of money, of which none of us had any to spare, or what, I don’t know. We had the idea of packaging the cassettes in a woodcut print, which Gretchen designed and printed by hand for the 50 or so copies we ordered. I used my trusty Smith Corona portable typewriter to make liner notes that we stuck on the cassette cases themselves. 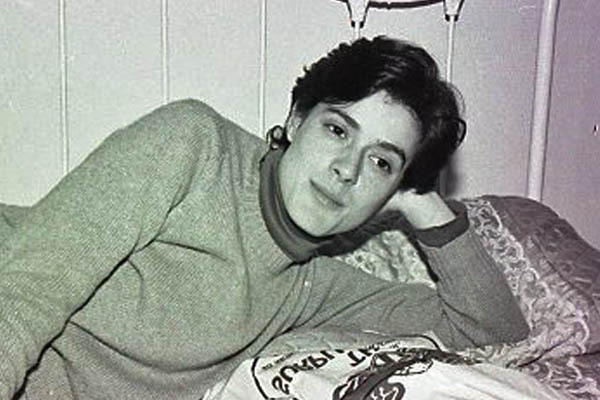 I still remember Gretchen and I, and maybe other members of the FJ, spending evenings in her attic apartment in South Portland wrapping copies of Six Songs. We sealed each package with a sticky red dot that Gretchen numbered for each print. I have a piece of cardboard, part of the box the tapes came in, that lists where each copy of the tape went. Fashion Jungle roadie and staff artist Gretchen Schaefer relaxing at the Outlook. Digital scan from black & white negative/Hubley Archives. We sold a few copies retail, through the Record Exchange at the foot of Exchange Street and through a TV shop at Westgate that also sold music. 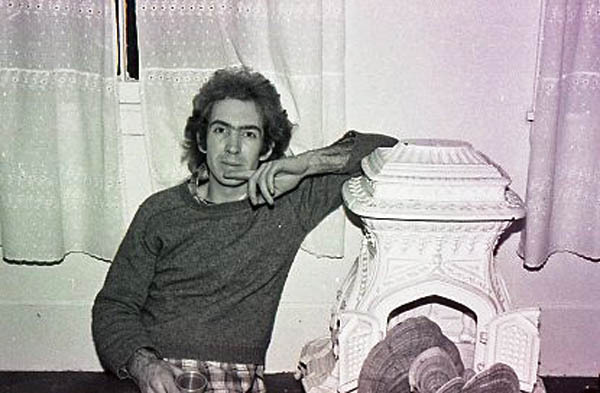 And I gave quite a few away — to friends of the band and to visiting famous musicians, such as Richard Thompson and the McGarrigle Sisters, with whom I came in contact through my growing career as a music writer for the Guy Gannett newspapers. I had new copies still in the original box into the 1990s. Mixing and packaging aside, I’m glad I don’t remember much about the actual recording process, because I think that means the sessions went well. In search of more information about our playing music together, though, I looked at my journal from 1984 this morning (Sept. 23, 2012). I’m kind of sorry I did. There was nothing about the Bethel weekend, but there was ample evidence of my self-absorption and immaturity — and, more germane to this article, evidence of the bad timing and conflicting goals, primarily personal, that ultimately fractured the Chapman-Torraca lineup of the FJ. Ken was facing graduation from the University of Southern Maine in a few months, had already started working at the post office as a temp (which severely restricted his availability for rehearsal) and was worried about a career. A detail of the woodcut print that Gretchen made for the “Six Songs” package. Courtesy of Schaefer Studio. 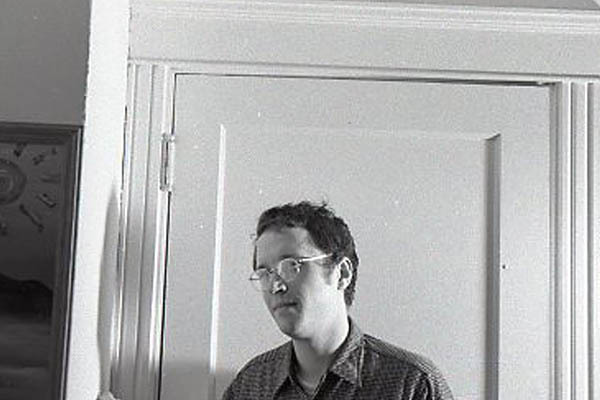 Steve was bored with making soup at a Portland restaurant and considering an education in computer work, which increasingly took him to Boston. 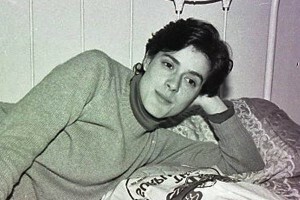 And Kathren, still in her late teens, was restless. At worst, she considered quitting the FJ altogether; at best, she talked about taking a break and visiting Europe. Which, as it happened, she did. These eddies and currents gained intensity as the year wore on. Things kept happening, from a cyst that sidelined me for a few weeks to Kathren’s Grand Tour to a rehearsal schedule that became increasingly erratic and non-productive. The songwriting pretty much stopped. But nevertheless, Six Songs was out there. And Portland, weirdly, was paying attention. The Fashion Jungle settling into the studio. Gretchen Schaefer photo. O clarity! O passion! 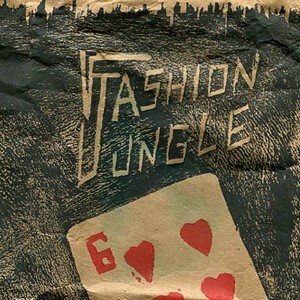 The Fashion Jungle’s Six Songs, presented for your listening pleasure in newly bright and impactful versions, thanks to the miracle of learning how to use technology. 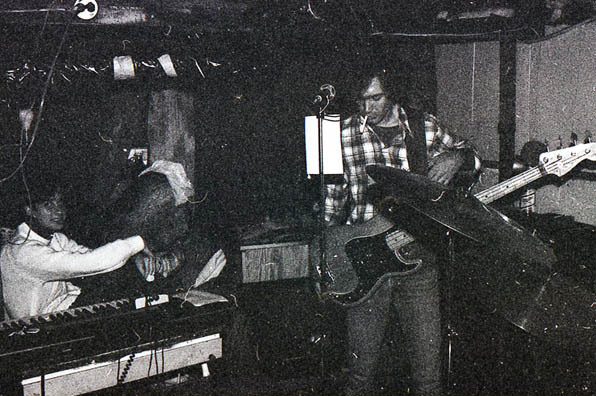 Recorded in January 1984 at the Outlook, Bethel, Maine. Remastered in 2005 and 2012. End of the Affair (Hubley) The Chapman-Torraca Fashion Jungle presents a number dating back to the last days of the original FJ. The lyric draws on memories of a breakup in 1980, but the song is much more interesting than the real thing. I started the lyrics during a Labor Day 1981 getaway at the Grey Havens Inn in Georgetown, Maine. Peacetime Hero (Sullivan) One of two songs that Jim Sullivan wrote for the original Fashion Jungle in 1981, inspired by the reintroduction of capital punishment. This excellent narrative stayed with the FJ from start to finish. Pleasures of the Flesh (Reynolds-Hubley) Ken sings his lyric about a “friends with benefits” arrangement that ultimately produces neither benefits nor friendship. I composed the tune for our second and last songwriting collaboration. Final Words (Chapman) Roaming through time and space on a sublime romantic journey, Steve’s second Six Songs contribution adds a stunning new dimension, as well as some lofty drama in a band known for such, to the FJ catalog. And Kathren’s keyboards are a perfect complement to the lyrics. Nothing to Say (Hubley) . . . and it takes me five minutes to say it. Not content to dwell on my own perceived inadequacies as a songwriter, I also took issue with the New Wave mega-sellout of the mid-’80s. 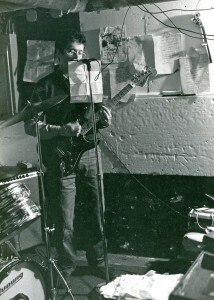 Nothing to Say Demo (Hubley) Around 1983 I developed the habit, which I still have, of settling into a bar to write song lyrics. The booze helps, but the decisive elements are the neutrality of the setting and the random stimuli. So it’s interesting enough to keep my brain ticking over, but there’s nothing for me to get involved with besides the song. I wrote this complaint at Carbur’s, a restaurant and bar on Middle Street, in Portland. Here’s the demo I recorded for the band to learn it from. Ken and Kathren. Gretchen Schaefer photo. “End of the Affair” and “Nothing to Say” copyright © 1984 by Douglas L. Hubley. “Curious Attraction” and “Final Words” copyright © 1984 by Steven Chapman. “Peacetime Hero” copyright © 1981 by James Sullivan. “Pleasures of the Flesh” copyright © 1984 by Kenneth W. Reynolds and Douglas L. Hubley. 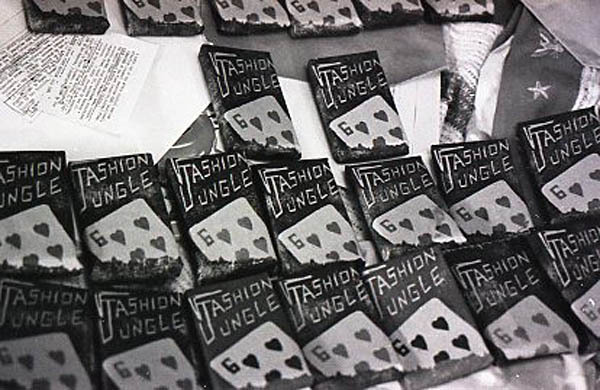 The Fashion Jungle looking crafty in a 1984 publicity shoot. From left: Doug Hubley, Ken Reynolds, Steve Chapman, Kathren Torraca. Photo by Gretchen Schaefer. Go directly to music! 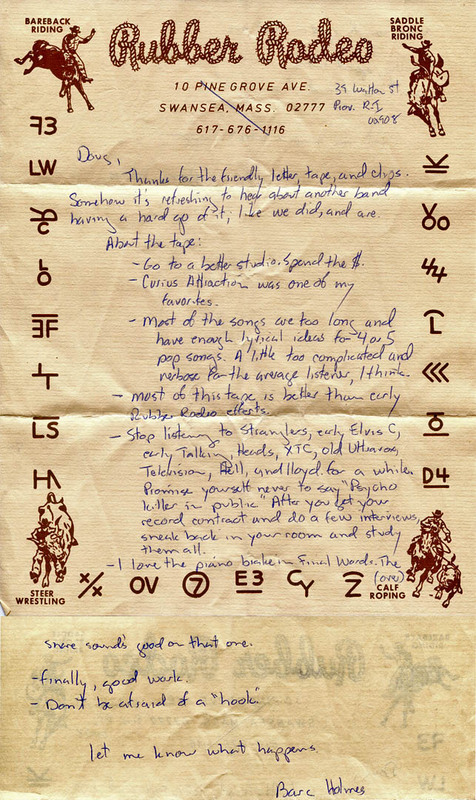 Skip self-indulgent writings of old man! It may seem strange to you young whippersnappers, but back in my day it was much more difficult to put recorded music out into the world. Then as now, the means for distributing music outside the confines of live performance were rooted in a mighty industrial apparatus. But for decades the industry occupied itself largely with manufacturing and distributing containers for music — vinyl, cassettes, etc. — that by today’s standards held a disappointingly small amount of sound considering the space they took up. Engineer Tom Blackwell at Studio 3’s second location, on Elm Street. Hubley Archives. While they were fairly priced for the consumer (at least until CDs came along), they seemed to cost plenty to produce, especially on top of recording expenses, and even more so if you aspired to any sort of production values. For my bands it felt prohibitively expensive, even as recently as 20 years ago, to have a bunch of recordings manufactured in any format. 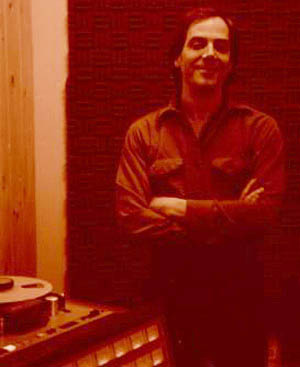 Nevertheless, it was and is the pop musician’s imperative to make recordings. It was part of the contract. You might never be able to do it — my band the Fashion Jungle came pretty close to not being able to do it — but, like the Muslim’s obligation to visit Mecca, you didn’t question the expectation. And why would you? Having a record was proof of legitimacy. More to the point, we get into music to play it for people, and what better way to play it for people than to sell them a record? For many of us, too, recording was not just a means to various ends (make money, make fans, make a reputation, etc.). Emotionally it was an end in itself. It was the mystery that, once penetrated, would answer all questions and solve all problems. It was the Emerald City. 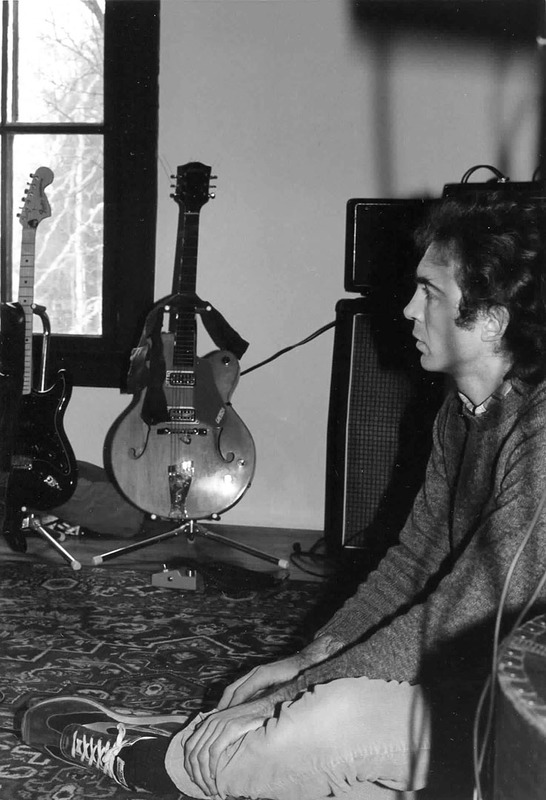 So many great things had happened in so many recording studios that just getting into one and cutting tracks was a compulsion beyond all reason. It was the world I thought I wanted to be in. Hiding behinds words as usual, here I am during a Fashion Jungle rehearsal in the Hubleys’ basement. Jeff Stanton photo. 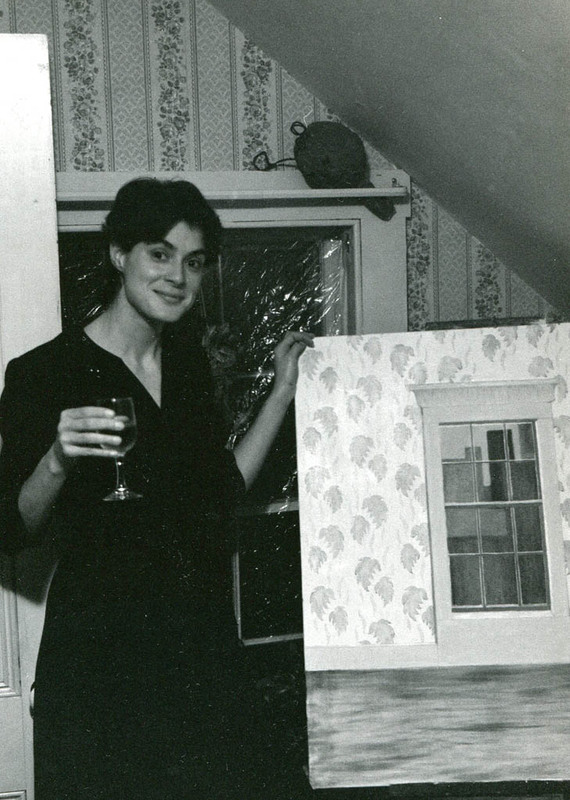 In the early ’70s I even tried to set my room in my parents’ basement up as some kind of studio, and I “produced” a recording, a collection of songs by a friend named Leah McKinney. All this based on a nearly complete lack of knowledge about studio realities. 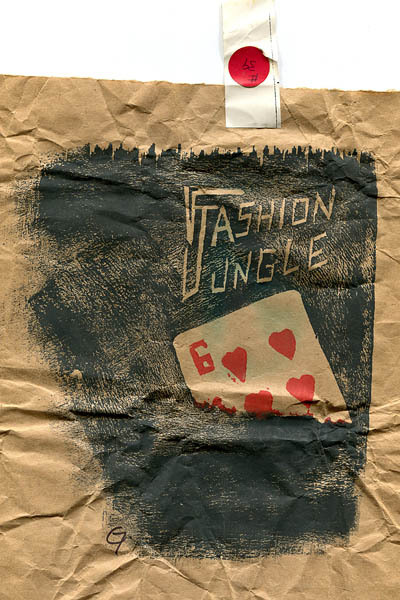 The original Fashion Jungle didn’t last long enough to get into a studio (although in terms of spirit and recording sound, I like the demos we did — on a Sony reel-to-reel in my parents’ basement — nearly as much as the professional recordings that came later. Hear them here and here). 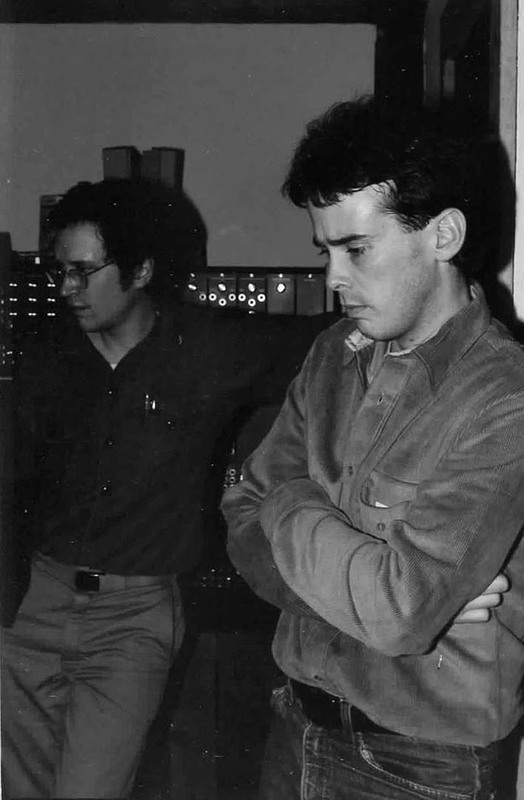 But once bassist Steve Chapman, drummer Ken Reynolds and I had worked together for a while, we knew that we had the goods and that we needed to lay tracks. I don’t remember how we chose Studio 3, which opened in 1981 in a little outbuilding behind the brick row houses on Park Street. 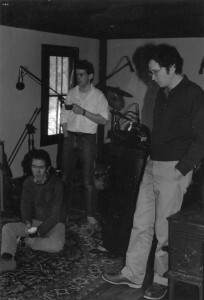 Tim Tierney was the business manager and Tom Blackwell, the studio engineer — both of them kind souls who made our first studio-recording experience more than pleasant. 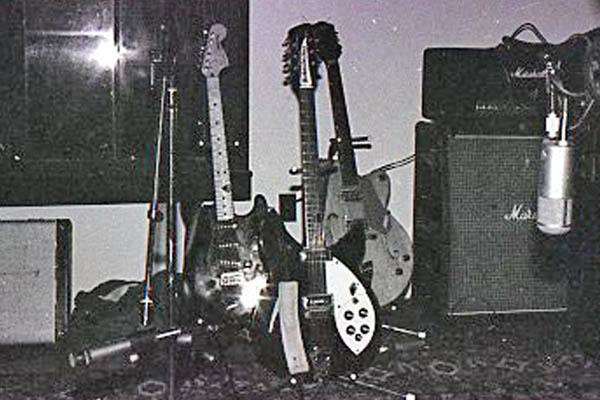 We spent one evening there in August 1982 to record one song, which was all we could afford. I still retain flashes of memory from that session. Nerves, of course. A tiny dim studio with zero atmosphere. It took some time to get a drum sound we liked, and the trial-and-error period included some experimenting with a water-filled snare drum that was one of Tom’s tricks of the trade. I don’t think we ended up using it, but it’s also true that the snare sound you hear (music below) is heavier, bassier, than Ken’s usual sound. We recorded “Shortwave Radio,” laying down rhythm guitar, bass and drums in one pass, and overdubbing lead guitar and vocal. I don’t think we needed a lot of takes. The result was probably a third faster than it should have been. 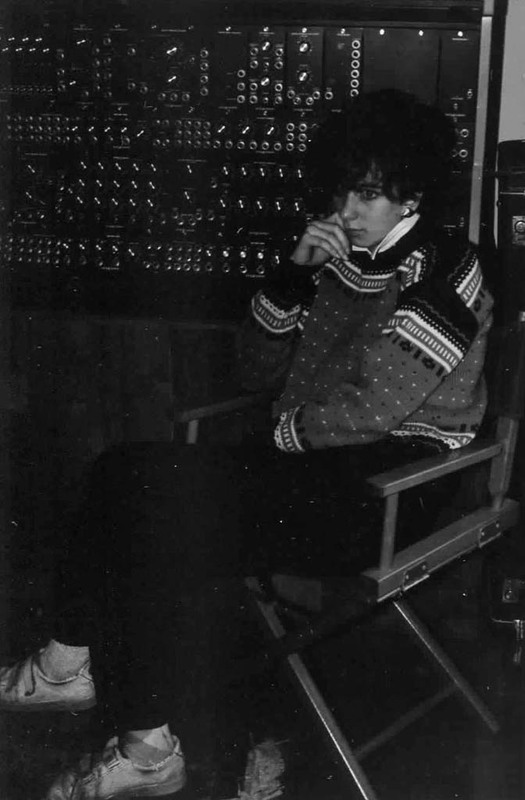 Studio nerves, maybe. The playing was good aside from the speed. We went in with no ideas about production or what sound we wanted. What we got was a very straightforward reproduction, clean, collected and businesslike. Kathren and Steve during a Fashion Jungle rehearsal in Ben and Hattie Hubley’s basement, 1983. Digital transfer from 35mm negative/Hubley Archives. Afterward we stood around in the parking lot shivering and rehashing the session. It was an unseasonably chilly night (1982 was one of those years without much summer in Maine). I don’t think we were happy with the recording — we weren’t happy about something, in any case — and I’m not sure we ever did much with it. Maybe got a few jobs on the strength of it. 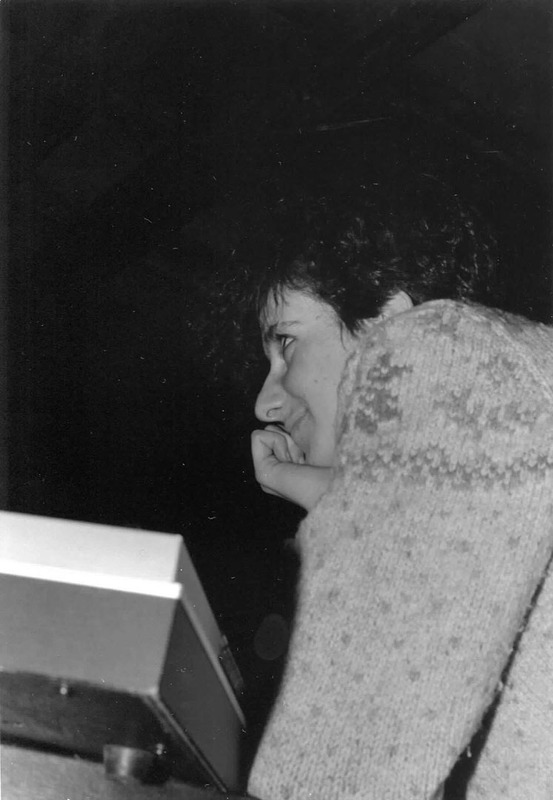 As previously noted in this space, keyboardist Kathren Torraca joined the FJ during the winter of 1983, resulting in the best-known FJ lineup. 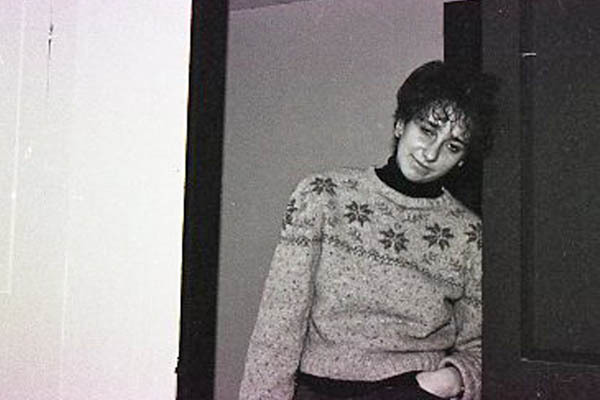 She was a quick study and we were ready to record with her by May 1983, a mere two months after her first live date with the band. Five of the six recordings below are from the three sessions that took place that month. 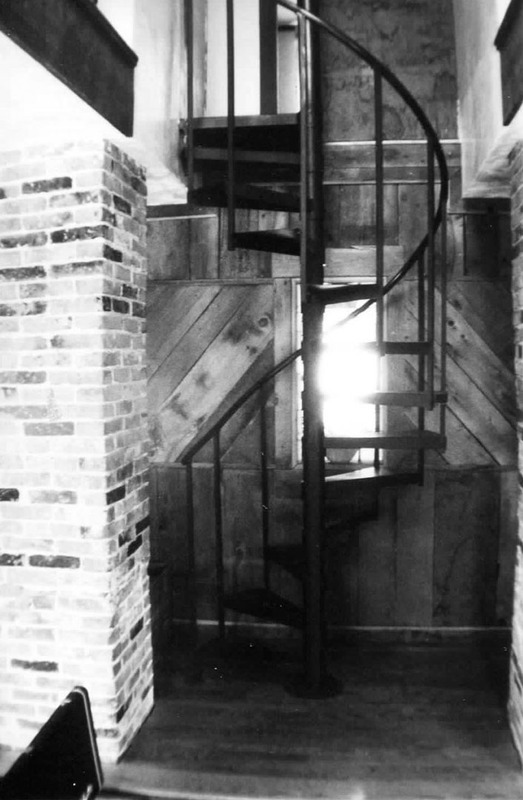 Again we worked with Tim and Tom at Studio 3, which had relocated to Elm Street, in Portland’s Bayside neighborhood. These were high times for the band and for me personally. I had finished classes at the University of Southern Maine the previous December, and Gretchen Schaefer, whom I had met at USM and partnered up with, and I graduated together early in the month (getting cold feet sitting in the Cumberland County Civic Center, where they had laid plywood over the hockey ice for our graduation; having beer, aquavit and croquet at my parents’ house; meeting for the first time Gretchen’s mother, May (appropriately enough) who came up from Connecticut in her olive-drab Ford Mustang for the occasion). I had a full-time job in the clip library at the Guy Gannett newspapers, working 11 a.m. to 7 p.m. every weekday, and rehearsing into the evening a few days a week. 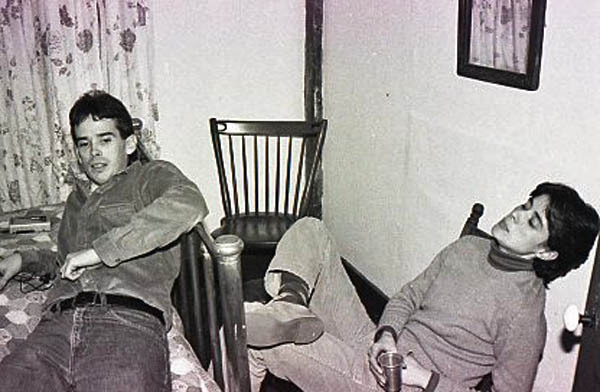 The FJ was playing out at few times a month — Geno’s, Kayo’s, Moose Alley, one-off gigs like a very lucrative date at Colby College that I wish to god I had recorded, because, as I recall, we were fabulous. (Maybe it’s better that I hadn’t recorded it.) And that date took place in between Studio 3 sessions. Man, we were pros! We were the bomb! It felt solid musically and personally. There was nowhere to go but up, and we were climbing fast. The May sessions fit that picture perfectly, at least as far as I can remember. 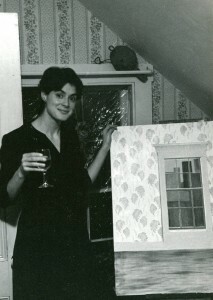 Gretchen with a new painting in the apartment on Preble Street, South Portland, that she moved into in 1983. The son of her then-landlord is now an engineer at The Studio, descendant of Studio 3. Hubley Archives. 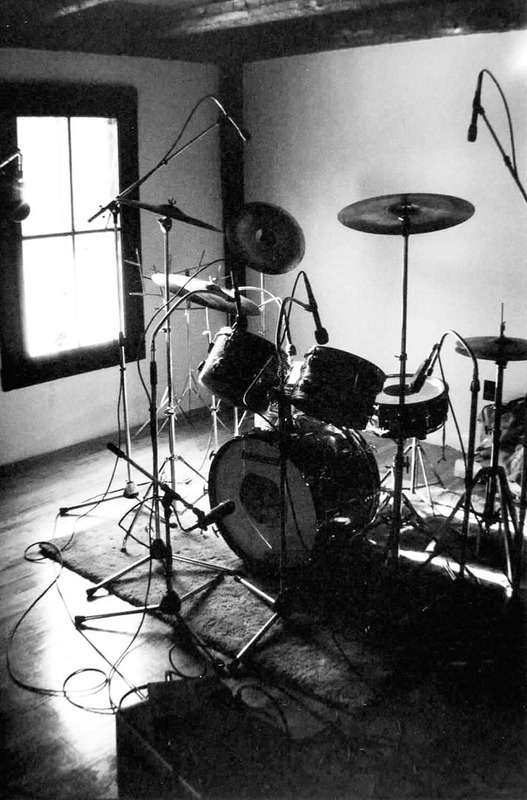 Considering our limited studio experience, we acquitted ourselves well, needing a minimum of takes, overdubs and punch-ins. Gretchen came down after work at the Boys & Girls Club, bringing us sandwiches and beer, and coming away impressed with how businesslike we were. 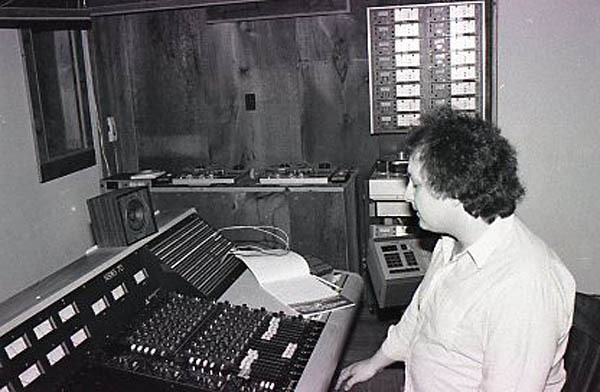 I have mental pictures of Tom Blackwell swabbing the heads on the 16-track recorder so often that it seemed like a tic or a reflex. I remember plying him with whiskey when we trooped into the control room to hear playbacks; I also recall Ken having to redo his “Entertainer” vocal because he kept singing, “She points her pank tongue at you” — instead of “pink tongue.” As Merle Haggard says, I guess I’ll just sit here and drank. What I don’t remember is why we didn’t record “Old Masters” or one of Steve’s other songs, considering how good they were. Instead, we recorded one new song, the dance-clubby “Entertainer,” which Ken and I wrote; my “Groping for the Perfect Song,” from 1982; and fell back on two tunes from the pre-Steve FJ, Jim Sullivan’s “Censorship” and “Little Cries,” the first song I ever wrote for the FJ. In the end, this second Studio 3 recording proved useful for getting work, and both the national music magazine Trouser Press and Portland’s own Sweet Potato reviewed it. But we never named, packaged or tried to sell it. Money was one reason. In addition, I don’t think we were that excited about the recordings. 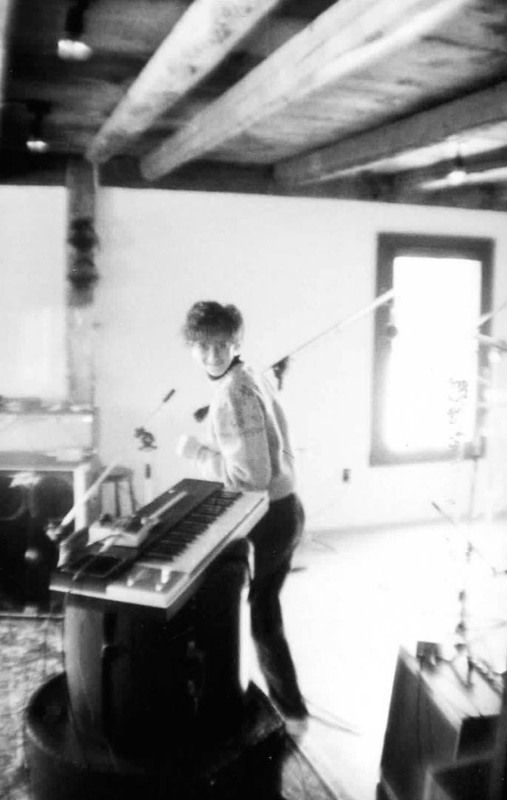 Like the August 1982 “Shortwave Radio,” we just played these songs too fast, excepting maybe “Entertainer.” Perhaps these were our usual tempos that worked on stage, where they were exciting, but not in the studio, where they came across as simply frantic. By the same token, because — again — we had no clue what kind of sound to try for, Tom gave us a very straight mix that showed off our playing well but failed to achieve any particular emotional effect. I guess this is why there are producers. We thought we could do that job, but we thought wrong. 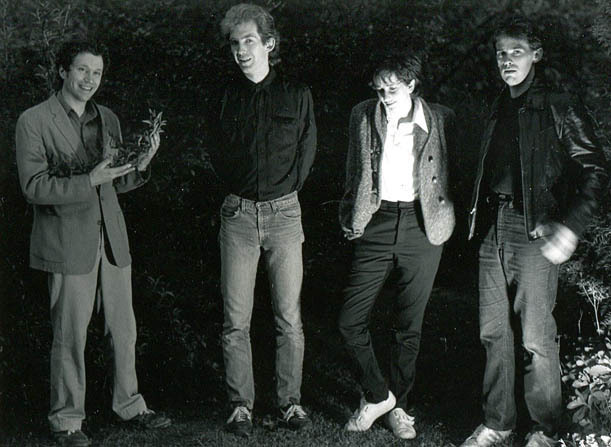 Hubley, Chapman, Torraca and Reynolds in a 1984 publicity image by Gretchen Schaefer. It was a dose of reality. They keep on coming. But still the recording imperative loomed over us. Phil Spector rode squirming on my shoulders. I guess The Recording Studio is one of those things that look huge and monolithic from a distance, but become smaller, more porous and more complex as you come closer. You start out walking toward the Emerald City, and end up facing just another door. Now for some music! 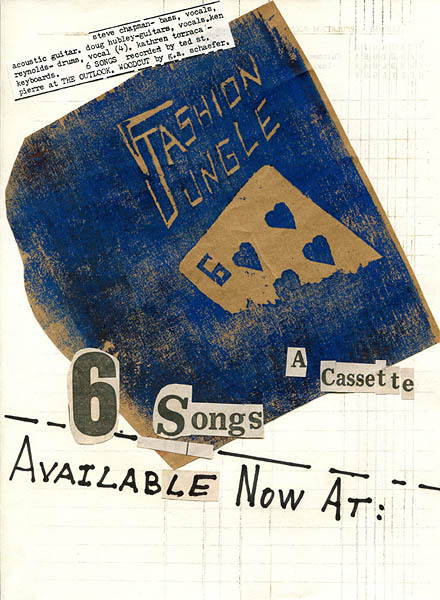 Six recordings by the Fashion Jungle made at Studio 3, Portland, Maine, in 1982-83. Censorship (Sullivan) Long after “Dumb Models” and “Fashion Jungle Theme” had fallen by the wayside, Jim Sullivan’s two contributions to the 1981 FJ endured in the repertoire, a testament to the excitement and musical integrity he built into his songs. This Studio 3 performance is some tight! Little Cries (Hubley) Another entry from the class of 1981 that stayed with the Fashion Jungle till the end. Ken, Steve and especially Kathren shine here. Two years after we recorded it, this track ended up on the Studio 3-produced charity LP Maine Rocks for the United Way. In our sole appearance on vinyl, ever, we were among such local luminaries as the Kopterz, Scouts in Action, Devonsquare and the Jensons (whose founding drummer was my boyhood pal Tom Hansen). Entertainer (Reynolds-Hubley) One of two songs that Ken Reynolds and I co-wrote. As with “Dumb Models” and “She Lives Downstairs,” the genesis of the song was a morally anchored Reynolds lyric exploring some aspect of sexual politics — in this case, strippers. I created the melody and tweaked the lyrics a bit. It is actually pretty good club music. Parts of this song or this recording ended up as theme music for two media products: Gretchen Schaefer’s video-class project “Art Who?” in 1986, and a slide show about a play performed at the college where I work in 2006. Groping for the Perfect Song (Hubley) One of the first songs I wrote after Steve joined the band, this stayed with the FJ for the duration and cropped up again nearly 20 years later in the Howling Turbines repertoire. I derived some sort of early inspiration for this from David Byrne, but that didn’t last. This recording is a bit mechanical-sounding, and may be the weakest of the May 1983 stuff. Please buy it anyway, because we need the encouragement. 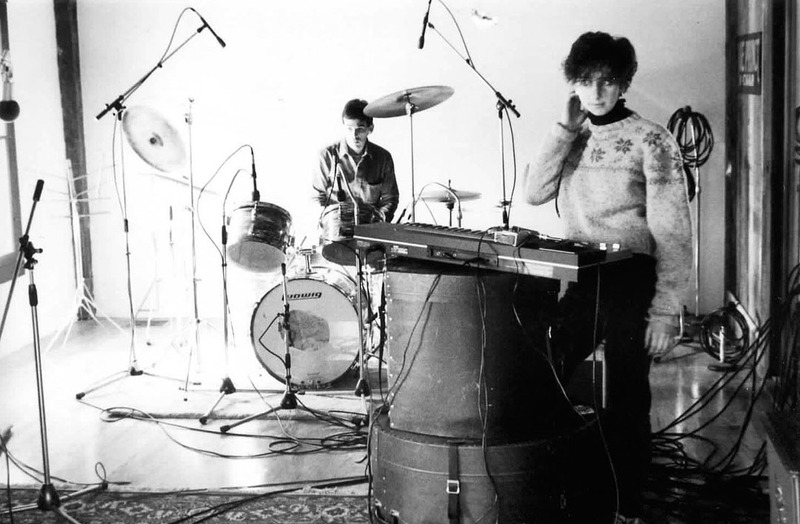 Shortwave Radio (Hubley) This 1982 recording made at Studio 3 was the Fashion Jungle’s first venture into the studio. A song that enhances an early glimmer of self-awareness with lyrical touches that attempt to symbolize trains, radios and winter weather. Entertainer (Digitally modified!) (Reynolds-Hubley) The same original recording as the previous version, this has been enhanced, or something, with digital reverb to add the kind of atmosphere a song about striptease artists really needs. “Censorship” copyright © 1981 by James Sullivan. “Little Cries” copyright © 1981 by Douglas L. Hubley. “Entertainer” copyright © 2012 by Kenneth W. Reynolds and Douglas L. Hubley. “Groping for the Perfect Song” copyright © 1983 by Douglas Hubley. “Shortwave Radio” copyright © 1981 by Douglas L. Hubley. All rights reserved. This time you can see my mouth — too bad! 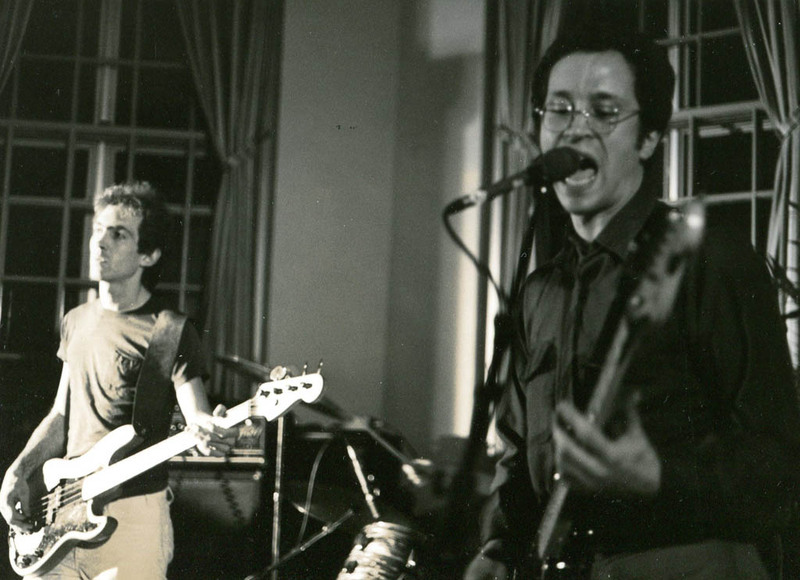 Steve and Doug during the May 1983 Colby College gig. Jeff Stanton photo.